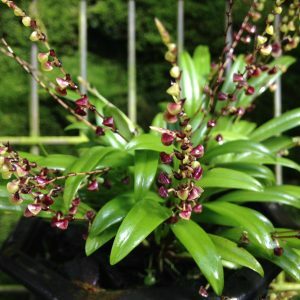 This smallish Stelis species has long lasting purple red flowers that although small are produced in profusion and give a fantastic flowering effect. The species is native to cloud forests through South and Central America and we find it a vigorous grower and flowerer when grown cool and wet. We grow our plant in a small basket that allows the plant good air movement and free drainage to complement the heavy watering we give it.